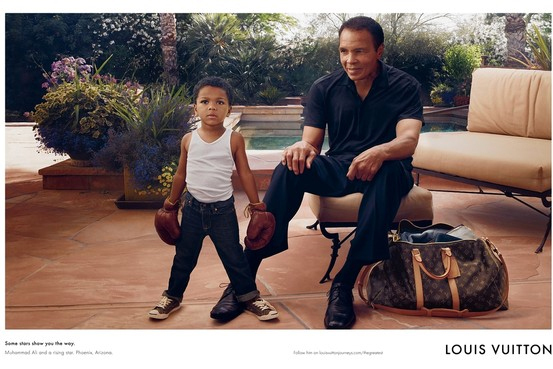 Louis Vuitton is running a fraudulent ad featuring Muhammad Ali. The ad with a photo by Annie Leibovitz is poorly Photoshopped and is insulting to anyone paying attention. This image is a sloppy composite, a poorly crafted lie. Ali is a great hero — The Greatest as he always said. But now he has Parkinson’s Disease and is severely disabled. The body in the image above is not his and his face has been reconfigured so that it looks more like Sugar Ray Leonard than Ali ever did. The image of his grandson looks real except that his grandfather wasn’t looking at him during any “photo shoot” that created this image. The image was created on a computer out of bits and pieces. This is a fantasy and a lie. All to sell over priced luxury items that have nothing to do with Ali now or ever. Ali at this year’s summer Olympics. actually lost money on photo assignments. I dislike her overly produced work but much of it, while not my taste is impressive in its opulence. This is not impressive, not opulent and doesn’t do Annie or Ali any good. At least Annie was paid well this time for creating an alternative reality — too bad its a reality no one needs. All I have to say is OMG…. Are you kidding me ??? Do you honesty believe that this was supposed to be Ali today??? Your totally missing the point of the add . anyone can see that .. I can’t belive that you honestly thought that you have picked up on something that you obviously thought others would be fooled by lol . The add is depicting the resemblance of a true champion and his grandson in their home, do you think there would have been a faltering resemblance if they had used Ali as he is today??. I love this shot and I would be proud of it if I was Ali and I’m sure that his grandson will be proud of it to when he is older ..
Hello Andrew — yes I believe this was meant to be Ali today. I’ve read several comments online and in the news referring to this ad saying how fit he looks. Most people aren’t aware of his condition. Most people don’t pay close attention to events and personalities. I think you are correct — the ad is showing how we would like Ali to look. But he never looked like that — he looked much better. Its a sham and I don’t like it. I think its false and a misuse of Ali’s identity. But its fine for you to like it and enjoy it. Thanks for your comment. Really?!? This happens to women in media everyday, I could give two shits about it happening to a famous man. Wow. Maybe I’ll write about the abuse of women in the media — it would be a good topic, KK. But I wanted to write about Ali. Why? I’ve followed Ali since before he was Ali, when he was Cassius Marcellus Clay, Jr. reciting bad poetry in Greenwich village to get attention. I was the only person in my department at Mobil Oil company (out of 50 or so) who thought he would beat Sonny Liston. I supported him when he refused to be drafted to fight in a ridiculous war — one if the many our misguided country has fought. From Wikipedia – “Ali inspired Martin Luther King, Jr., who had been reluctant to address the Vietnam War for fear of alienating the Johnson Administration and its support of the civil rights agenda. Now, King began to voice his own opposition to the war for the first time.” Ali isn’t simply a famous man, he is a living symbol of the righteous under dog, and I find the misuse of what passes for his image disgusting. And yes the objectification of women is also disgusting — I especially dislike the way photography is abused to achieve that disgusting end. Kids too are turned into something out of a fairly tale or worse, a bordello for pedophiles. So yeah – its bad — but just not the story I was onto that day. I despise images so retouched and detached from reality that they’re not images of a PERSON anymore.